This summer, check out Admiral's Tavern beer garden on Cruiser Olympia. Admiral's Tavern will soon re-open aboard the world's oldest steel warship still afloat, Cruiser Olympia at Penn's Landing. 2019 marks the third year the springtime beer garden has popped up on the historic ship, which is part of Independence Seaport Museum. The beer garden's opening day will be Friday, May 10. Through spring and summer, Admiral's Tavern will be open Fridays and Saturdays from 6:30 to 10:30 p.m. Visitors will be able to enjoy craft beer, wine, cocktails, food, games and entertainment aboard the ship, while taking in views of the Delaware River waterfront, including the Benjamin Franklin Bridge. 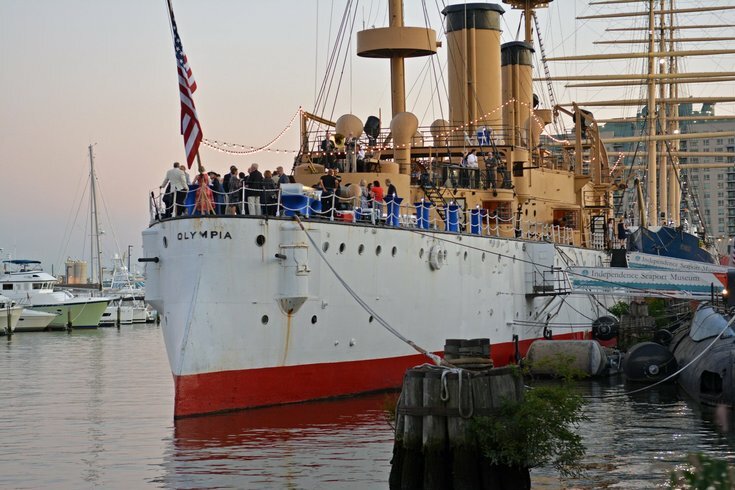 Find Cruiser Olympia between Spruce Street Harbor Park and the Moshulu.